Toll booths provide a perfect example of a traffic/transportation related application that can benefit from the remote reboot and power control capabilities provided by the NPS-3F15 Network Power Switch. As is the case with other transportation related applications, problems with networked devices in Toll Booths can also result in traffic tie-ups and delays. But in Toll Booth applications, there’s also an economic factor involved: malfunctioning devices in Toll Booths and Kiosks can create a situation where toll fees cannot be collected and driver information cannot be captured. 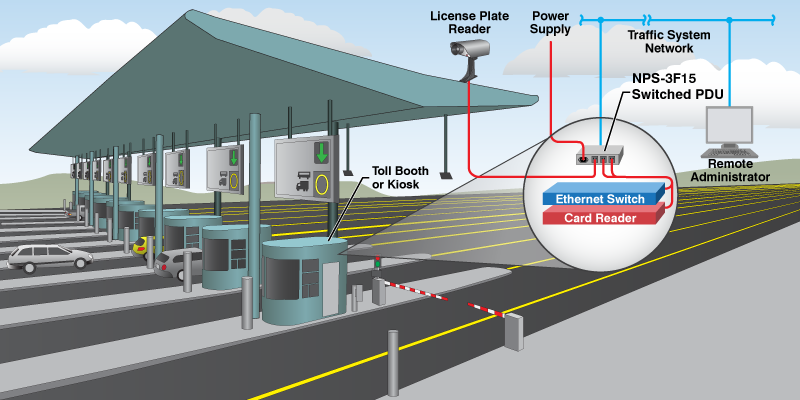 In Toll Booth applications, the NPS-3F15 Network Power Switch is often used to provide a means to remotely reboot devices such as card scanners, tag readers, toll collection systems, license plate capture cameras and other networked devices. When any of these devices fail, remote administrators can immediately establish a secure connection to the NPS unit and then initiate power reboot operations to restart unresponsive devices and restore normal operation. The NPS-3F15 Network Power Switch works equally well in both manned Toll Booth applications and unmanned Toll Kiosk applications, but the end result in both cases is the same: faster resolution of problems at the remote site and reduced downtime. The NPS provides remote administrators with an effective, secure means to reboot unresponsive devices at distant Toll Booths or Toll Kiosks to bring networked services back on line, ensuring that tolls can be collected and traffic continues to move freely. For more information, please contact WTI.